Movavi is an all in one screencasting software that allows you to perform screen video capture, edit and sharing with friends. Movavi is compatible with all versions of Windows including Windows XP, Vista, 7, 8 and 10. It also support Windows that are already installed with up to date patches and service packs. 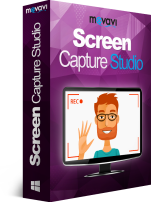 The easy to use screen video capture software allows you to capture webcam video and screenshots. It allows you to import the video from a video streaming site.You just have to set the video parameters and you can start capturing the video from your webcam. Movavi allows you to adjust the frame rate to 60 fps or lower. Next, you must choose a recording area by dragging the square to the specific part of the screen you want to capture. Movavi can capture audio from various sources including speaker, skype calls, sound effects from applications, microphone and MIDI devices. If you are recording an audio in the background, you can use the volume control to increase or reduce the sound volume. Movavi allows you to capture every single activity on the keyboard and mouse cursor. You can highlight the mouse cursor with different colors and click sounds. There is an option to make adjustment to the click volume. When you are done editing the video, it is time to save it in your preferred media format. Movavi supports a wide range of media formats for video conversion so you will surely find the media format you need. Movavi supports the SuperSpeed mode, a very high speed video processing mode that take much lesser time to save the video. The SuperSpeed mode can produce the highest quality of output file without the use of any video re-compression. You can use hot keys to capture the screen as well as scheduling the timer to start and finish the screen capturing at the time you set. The footage can be cut into as many segments as you want. You can add subtitles, background music and special effects onto your video. You can set the size of the screen video capture area by entering the dimensions into the box. In conclusion, Movavi is an affordable screen video capture software that you can use to capture anything you want such as webinar, online chats, and presentation. The straightforward layout on the video editing software makes it suitable for newbies who don't have experience in video editing.